Attached your documents. Be aware that if I have to manufacture the stair then use risers with a 11.5mm thickness as this is what I use for risers. This is a veneer riser on mpx base. That will then be the next project. Can I get the work files and the dxf files from the current project? In the first place, I want to carefully measure and check everything again. I hope everything is already a bit more accurate and fits. This is not possible in stairdesigner. The only way to make this is creating an extra stair with fitting dimensions to add in the build. You can put them together in a cad program to see the results but you can not make it as one stair in stairdesigner. Also in most of the stairprograms even the expensive ones this is not always possible. Just to be clear. When using a traditional setup with a visible stringer means that the shape of the concrete stair needs to be cut out below the wooden step and behing the risers. See picture. So a penetration of 42mm which is the complete width of the stringer will just weaken the structure. 15mm is enough. You need the width of the stringer to attach the steps with screws so it needs to be strong. I had done the high offset above the noses to have enough space for lighting (spots) to be built. I added the 97mm offset to the stinger because the stinger did not match the riser under the landing. The left stinger (outside) I had set to 42 mm penetration because the concrete staircase is anchored in the wall so that the noses and risers of the stairs were under the outer (left) stinger. The part of the stinger next to the noses and under the noses should leave. Or is there another way of implementation. When i download Stairdesigner on wooddesigner.org i get always 7.05 and not 7.05A. Is there some place to get the right version? Nederlands toch net iets makkelijker om te communiceren. Bedank voor je advies. Ik heb tot nu toe “engels” gebruikt, ik wist niet dat nederlands toegelaten was. Melding : “The file was created with a more recent software version”. You have a very high offset above the step nosings . Is that needed or only on the top of the landing ? offset 70mm and the stringer on the landing is 97 mm offset ? 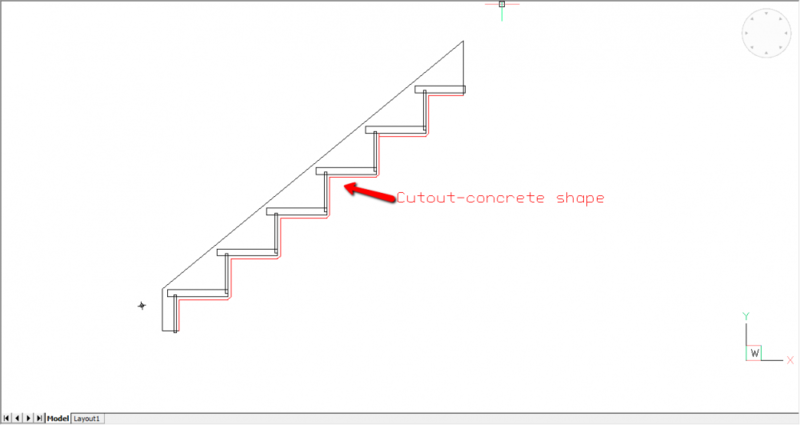 For a first stair it will be challenging as you want to cover an existing concrete stair so pay attention to have an accurate measuring of the concrete stair and put it in a cad program. When you have your documents and files you can import your stair to put it on top of it and check if everything fits which I doubt it will the first time. If you get your files this month you will be allowed to get a corrected set next month but You can only get 1 set of files for free per month. Also height check is important and check if the outside stringers will cover far enough downwards to cover the concrete stair until the finish part of the wall. Also depending on the situation which I do not know you will have to cut out the stringers tha will remain on top of the concrete stair. 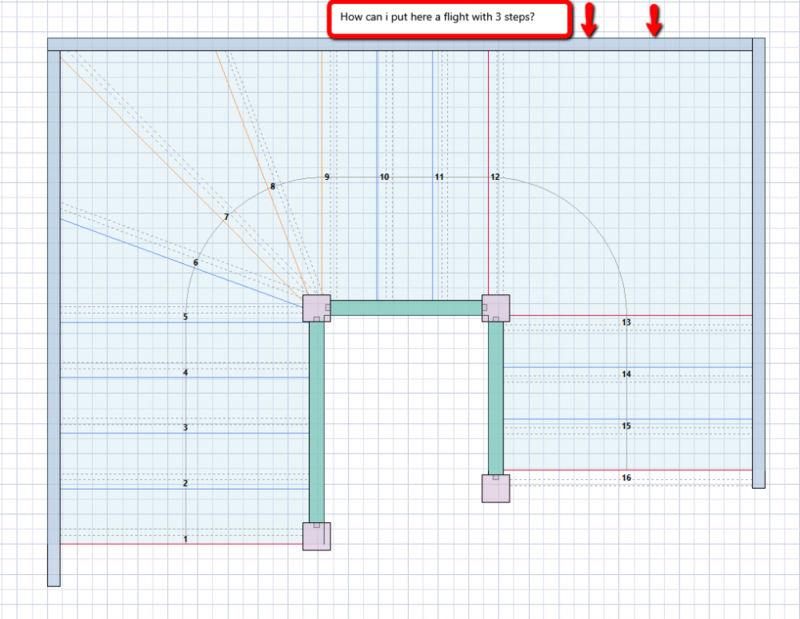 This cutout can be drawn in a cad program too to adjust your stringers. Thanks for the advies on the technical side of the stair, I greatly appreciate your advice. small problem on step 7 that is cornering the newel . This should be avoided if possible How can i do this? At this time i just need the plans for a price calculation, wood and fabrication. I make the final plans later when i have a target price. I hope this is possible? Do you have earlier experiences with stairs ? I see some issues on the technical side of the stair . To cover a concrete existing stair it needs to be measured well and fit on the concrete stair. I do this in a cad program where I draw the measured concrete stair top view to see if I have the needed clearances to cover the side and the steps. Also a height check needs to be done to see if the concrete is not going to bump into the steps. also the penetration of the stringers in the newels please set to 15mm and if you use this option of penetration I advise you to use a upper and lower recess of around 25mm to fit the stringers in the newels. Do you need the 140 mm length beyond the first step on the left stringer ?? What is the reason of having 650mm beyond the last step on top of the stair ? Do you have an exit on the left of the landing ? Is that correct on width an measurements ? You have no banisters in the railings . Are you going to use something else ? riser of step 8 is not covered by the stringer. If not possible to notch it in the ewel then the stringer needs to be adapted . The latest version of SD7 7.05 has this possibility. Thanks for the fast reaction, I hope that now I uploaded the file correctly. Yes Michel thats exactly what I want to do. the outside stringboard just need to cover the steps, and i want to place some led’s in to the stringboard or steps. I think this is not possible i Stairdesigner or am i wrong? Attache your file so I can have a look at it . As I understand this is a strairproject to cover a concrete stair ? I don’t see your file attached. Just to inform, the answer will be possibly longer than usual as most of us are on holiday. I’ have a premium account here and I want the dxf-files and the manufacturing documents if possible. It is my first project with stairdesigner, I hope it is a bit OK.